The 2018 United States Grand Prix (formally known as the Formula 1 Pirelli 2018 United States Grand Prix) was a Formula One motor race held on 21 October 2018 at the Circuit of the Americas in Austin, Texas, United States. 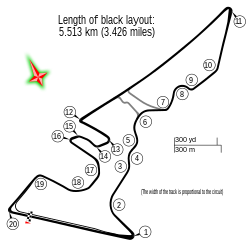 The race was the eighteenth round of the 2018 Formula One World Championship and marked the forty-eighth running of the United States Grand Prix, the 40th time that the race run as a World Championship event since the inaugural season in 1950, and the 7th time that a World Championship round was held at the Circuit of the Americas in Austin, Texas. Mercedes driver Lewis Hamilton entered the round with a 67-point lead over Ferrari's Sebastian Vettel in the World Drivers' Championship. Hamilton's team-mate, Valtteri Bottas, sat third, a further 57 points behind. In the World Constructors' Championship, Mercedes held a lead of 78 points over Ferrari, with Red Bull Racing a further 141 points behind in third place. The race was won by Kimi Räikkönen, who made a one-stop strategy work, achieving his first Grand Prix win since the 2013 Australian Grand Prix, breaking a record-setting 113-race winless streak. It was also his first for Ferrari since rejoining the team in 2014 and Ferrari's first win in Austin. ^1 – Sebastian Vettel received a three-place grid penalty for failing to slow sufficiently during a red flag period in Free Practice 1. ^2 – Pierre Gasly received a 35-place grid penalty for exceeding his quota of power unit elements. ^3 – Brendon Hartley received a 40-place grid penalty: 35 places for exceeding his quota of power unit elements and 5 places for an unscheduled gearbox change. ^4 – Max Verstappen received a five-place grid penalty for an unscheduled gearbox change. ^1 – Esteban Ocon originally finished eighth, but was disqualified for exceeding fuel flow limits on lap 1. ^2 – Kevin Magnussen originally finished ninth, but was disqualified for consuming more than 105 kg of fuel during the race. ^ "United States". Formula1.com. Formula One World Championship Limited. Retrieved 17 October 2018. ^ "Formula 1 Pirelli 2018 United States Grand Prix – Qualifying". Formula1.com. Formula One World Championship Limited. 20 October 2018. Retrieved 20 October 2018. ^ "Formula 1 Pirelli 2018 United States Grand Prix – Race Result". Formula1.com. Formula One World Championship Limited. 21 October 2018. Retrieved 21 October 2018. ^ a b "United States 2018 - Championship • STATS F1". www.statsf1.com. Retrieved 21 March 2019.